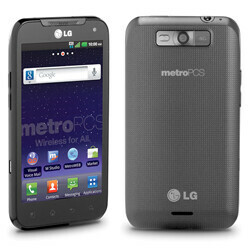 The LG Connect 4G has just been launched on MetroPCS. The Android powered handset is running Android 2.3 Gingerbread, features a 4-inch screen, a 1.2GHz dual-core processor, 1GB of RAM, front-facing camera for video chat, rear-facing 5-megapixel camera, 720p video capabilities, and, of course, supports 4G LTE connectivity. It is available now through MetroPCS’s website for $349 minus a $30 mail in rebate, making the final price $319. While at first glance that may seem steep for a mid-range Android handset, but considering one of the major draws to MetroPCS is that there are no contract requirements and the monthly rates are extremely competitive, it is a very reasonable price point. That's really a good price without a contract. About right for a mid-level phone. One thing for regular customers that have metropcs, if you buy this or any other phone from metro as a upgrade, better make sure its for you. No Returns, No Refunds.